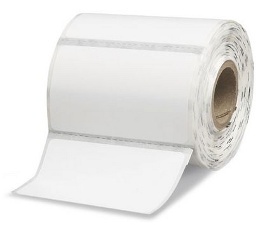 Zebra Z-Ultimate 4000T Thermal Transfer Barcode Labels (3.00 Inch x 3.00 Inch; 230 Labels/Roll, 12 Rolls/Case). Gap Sensing. UL/cUL indoor/outdoor and CSA indoor/outdoor recognition when paired with Zebra's 5095 and 5100 resin ribbon. Use with Zebra P4T printers. A Premium white gloss thermal transfer polyester label with a high-performance permanent acrylic adhesive. Ideal for applications requiring up to 3 years outdoors, resistance to moderate chemicals and temperature exposure up to 300 degrees F.